If you're looking for a lovely lunch with your group of friends especially your lady friends. Try Riley Street Garage for their special Ladies Lunch. There's a set menu which includes a glass of champers, and special gift bag. It is important to pre book to get these special extras. The menu is a lovely mix of 6 dishes, including some vegetarian options and seafood, set at $60 per person. I was very impressed with the interior design, open plan with a large bar in the centre. Not only a great option for your ladies lunches but for large groups or functions. I'm already booked for another one soon! Celebrate the year of the Sheep with some Shanghai Dumplings..
Having run the Fruit&Veg Co-op for nearly 5 years now, I've known for quite some time the importance of buying locally grown produce. It's fresher, often not frozen for transport and lasts longer in the fridge. It's not always the prettiest but will often taste better. Supporting our farmers is so important not only for our economy but for your national identity. It's not always possible like with garlic, which has a short season and small harvest- but Australian garlic is the best in the world. Buying seasonal produce is better for us and it's a more economically way to shop. You can't always have everything you want when you want, but it makes those seasons even better when you can. Start your own co-op and buy direct from the farmers, or at least buy Australian grown. Encourage your supermarket to stock Australian produce. Looking for a little treat to give your special someone? I always think a special dinner out somewhere nice and a hand made dessert at home is the best way to spend Valentine Day with your special someone. 1/3 cup of cream, whip after measuring. 10 small tart cases, I brought already made ones form the supermarket. Whip the cream and leave to the side. Soak the gelatine in the cold water, once soft add the bowling water until dissolved. You need to give it a stir to help it along. Add to the gelatin, the strawberry puree, 3/4 cup of the sugar and the salt. Stir until it thickens. Fold in the whip cream. In a metal bowl whip the eggs white with rest of the sugar, and fold into the mix. Careful not to take all the air out. Pour into your tart cases and decorate with extra strawberry. You can also just put into ramekins with out the tart cases if you're gluten or dairy free. Place in the fridge to set. Well you've got your lamb for the day, but whats for dessert? I bough the nest form the supermarket. Buy as many nests as you like. I used mango for 3 nests, and 1 passionfruit per 2 nests. Whip some cream. Layer your nest with cream, then finely diced mango. Finish off with passionfruit on the top. Too easy. Hope you're set for Australia Day! Combine all ingredients in a bowl. Place lamb cutlets in the bowl and let sit in the fridge for at least 1/2 hr to marinade. On a high heat cook each side of the cutlet for 2 min. Let the cutlets rest for 5 mins before serving with a fresh and healthy salad. For those who missed it, our little co-op was mentioned in The Sunday Telegraph. After imported produce were found to be contaminated, it was a nice plug for local growers but also a timely reminder to buy local and seasonal. Yesterday our Fruit&Veg co-op had a jar swap as part of our pre- Christmas celebrations. A great variety including the good old favourites of chilli jam, lemon butter. But an interesting mix of curry paste, Sourdough mother, Baileys Irish cream and cookies. I'll show you each of their uses as I get through them. Buckwheat pancakes with fresh strawberries and blueberries to start your day. 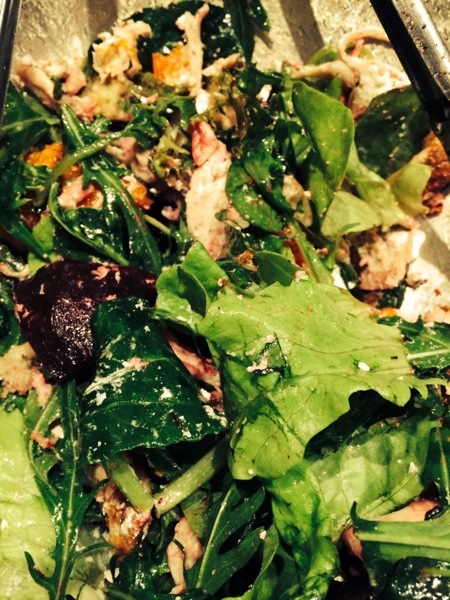 A fresh salad of goats feta, roasted pumpkin, and beetroot( left over from the last Fruit&Veg shop). Lovely lettuce and rocket to tie them all together. Also try strawberries muffins for brekkie or a snack! Get onto Instagram and check out my interactive work for InStyle Magazine Australia and Marie Claire Magazine Australia. Looking forward to incorporating many more if these little projects into my normal day of shooting. Let me know if I can help you with any if these features! Although it's still cold the days have been so lovely here in Sydney. At the moment throw a little fertiliser on your lemon and lime trees ready for the spring time growth. My lime tree is coming along nicely hoping for a good 1st harvest this season. If you're wanting to plant in spring get some fertiliser into the ground and turn- getting ready. 7th June- New Jonathon &Boys (long weekend)IS EVERYONE HERE FOR THIS WEEKEND? Looking for authentic Greek gyros in Sydney? There's a new place in Bexley on forest rd. Be prepared line up, there's always a queue but moves fairly quickly and worth the wait. It won't break the bank-pork gyros 7.80, with a can of soft drink $10.30 and a chip combo $13.00. A live music venue in the heart of Marrickville. Open 8 months now, the barman tells me that he gets run off his feet, and has done from day 1. I've come on a Sunday at 5pm just as the crowd starts to build. The interior is as the website describes- eclectic! Chandeliers and leather lounges fill the room, almost too many. But I get the impression this isn't a place the crowd gets up and dances but rather sits and enjoys the atmosphere, which it certainly is full of, even without a crowd. The menu boast nachos and stone cooked pizzas at around $16 each. My advice eat great food outside on the many wonderful places that surround Lazybones and come here for a drink after.